Lavender adds such a unique floral sweetness to any dish you put it in and it is just lovely to look at. There is a cute little lavender farm just outside of Portland where I was able to pick a big bunch of lovely purple buds fresh from the feild. 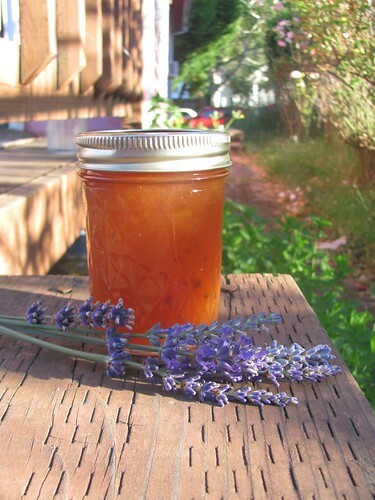 I decided that peaches would be the perfect partner for lavender because they are so sweet, clean, and mild. The flavors in the jam mix perfectly. I like the strong floral umpf that the flowers offer, so I was a little heavy handed with it - but if you are a little shy on florals you can just use tea without adding the buds. The first step is to make a lavender "tea". Mix 1/2 cup of hot water with 2 tablespoons of lavender buds. Mix over high heat until the mix comes to a boil. Take off the heat and leave to cool completely (30+ minutes). 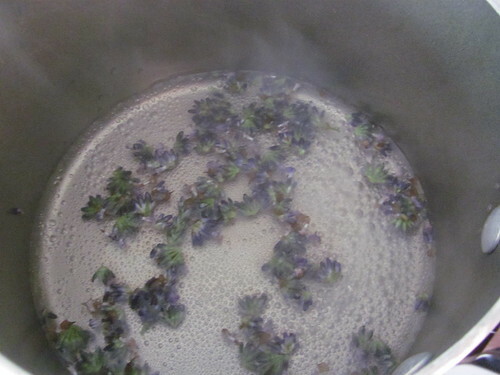 Then drain out the buds to collect a lovely fragrant purple tea. Next, start work on your peaches. You will want to remove the skins because they can be bitter and chewy. 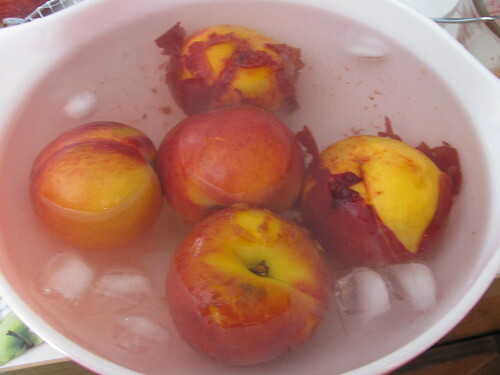 The easiest way to peel peaches is to put them into boiling water for 30 seconds, then drop them into an ice water bath. The skin will rub right off. Once the skin is off, you can dice your peaches and put them into a large pot. Mash your peaches down a bit with a potato masher and turn the heat to medium-high. Add your lemon juice, lavender tea, and buds. The amount of sugar that you need will depend on which type of pectin you use, so be sure to check that little handy guide that comes inside your pectin box. This recipe is based on using a low sugar pectin formula. The low sugar pectin is always my go-to becuase it produces a solid jell with a sweet flavor without being completely overwhelmed with sugar. It also is availabe just as readily as the traditional high sugar kind. If you are using a regular pectin, you will probably need about 8 cups of sugar. Take 1/4 cup sugar and stir it into the package of powdered pectin. This will help the pectin to not clump up. Add to the peach mixture and stir well. Bring to a rolling boil - one that you are not able to stir away. Once you are at a good soild boil, add the rest of the sugar and stir. Bring back up to that strong boil and let boil for exactly one minute. Remove from the heat. To check your jam for consistency, I like to keep a metal spoon in icewater ready. Scoop a bit of the jam and let it cool completely (the freezer can help with that). Once the jam cools, you can make sure it is the jelly consistency that you like. If it is too runny, you can add more pectin and boil for one more minute. Once you are at the right consistency, you can start filling your jars! Process for 10 minutes in a hot water bath. You can also make this a freezer jam or just make a small batch to enjoy that week (don't worry, it won't last long!) if you don't want to fuss with the canning process. This jam would make an excellent sweet marinade on meat or just a perfect element for your toast! I am always looking for new recipes using lavender. I will definitely try this jam, thanks!